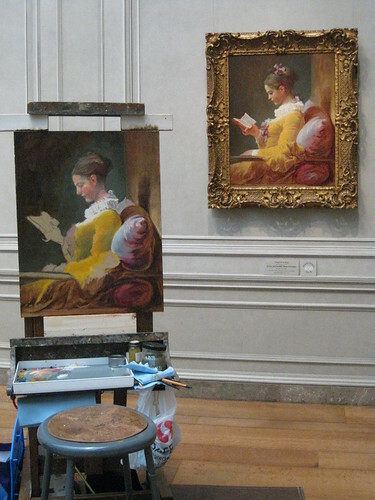 This Monday was my second day working on Young Girl Reading by Fragonard. I started the day laying in layers of burnt umber and wiping away to vary the values. Later as the day went along I started to lay in the yellow of the dress and the lighter tones of the pillow and collar. After lunch I started blocking in the head, re-working it several times and by the end of the day knowing that something was off. From this image it is easy to identify where proportionally things have gone astray. 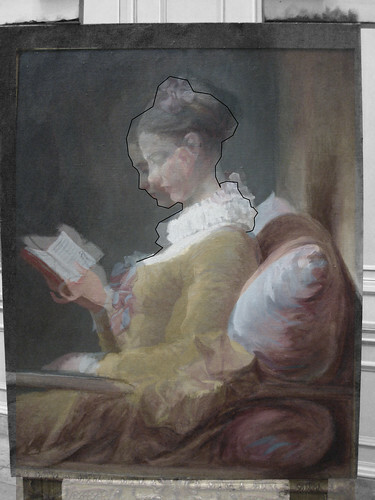 The young girl in my copy is more narrow and tall than the original, in fact with further analysis I realize that her head has become much more elongated, making her look older and more mature. So next week will probably be all about correcting these issues before moving on and getting more of the painting completed.